The fauna in Bhutan can be deadly | Where to next? Two blue tents for sleeping and the toilet tent perched near the edge. See the dog waiting in the road below? Bugs love me. In 1971, I landed in the Middle East for the first time and about two million mosquitos zeroed in on me singing out Dinner is served. Generally, I do my utmost to avoid the biters and stingers. Bug repellent and I are good friends. So much so that my mother predicted that my adult perfume would be a scent called Eau de Bug Spray. And it’s true that I wear more Rid than I do perfume. Our overland travels always present certain challenges for me. If there’s a risk of mozzies at night, I cover up with long sleeves and long trousers. I also carry multiple bottles of Rid, Australia’s tropical strength +antiseptic insect repellent, that I roll on daily. I managed very well during our 10 weeks in India even though were we camping at least half the time. Got maybe one or two bites a week. But my guard was down in Bhutan. Good grief, it was freezing. It’s supposedly spring here, but I’ve been wearing closed shoes, woolly socks, long pants, three layers of merino tops, a beanie, gloves and a puffy jacket. Some nights the temperature has dipped to 2–3°C (or 35–37°F). Surely there aren’t any mozzies about. But I forgot about fleas. Every single campsite (we aren’t in actual campgrounds) has been overrun with dogs. Having been bitten in 1986 by a dog that later became rabid, I have a personal travelling policy of not touching dogs I don’t know. Never mind how much I love dogs, I still remember the series of injections I needed back then. 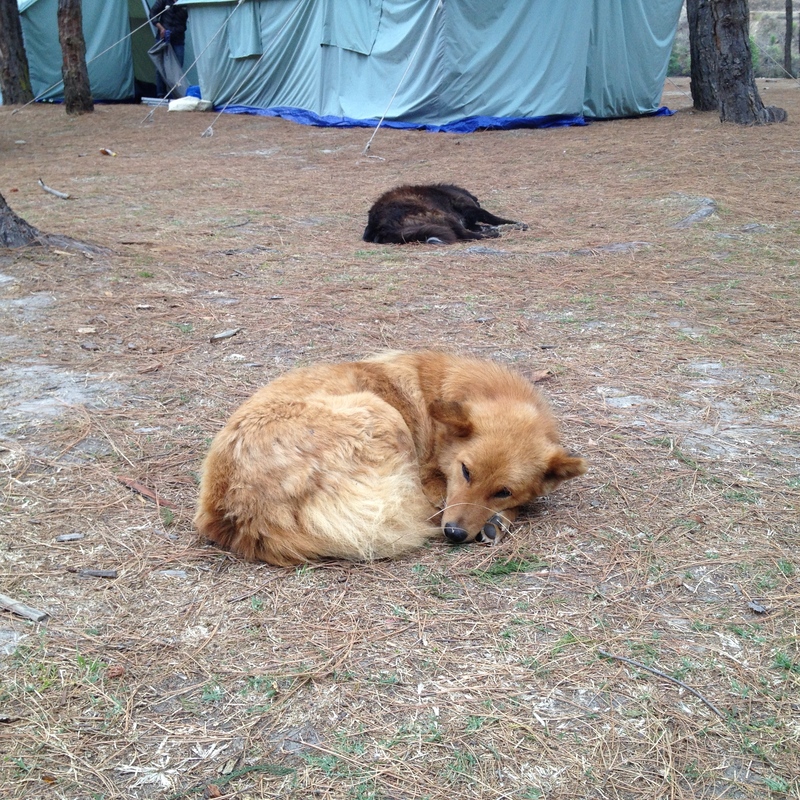 So I have not honeyed up to these camp dogs. Nevertheless, they make themselves at home around the camp. All day they lie curled into tight balls, perking up when the dining tent shows some activity or as soon as the sun goes down. Nightfall brings on their barking frenzy. They race round and round our tents and weave back and forth across the campsite. Too late it dawned on me that their patrolling was also scattering fleas everywhere. A swarm of those fleas found me. And based on where most of the bites are, it’s obvious that I was caught with my pants down, literally. Our camps haven’t had a toilet, per se, but a toilet tent. That means a rectangular hole dug in the ground with a small tent set up over it. The dug-out soil is spread around the edge of the inside of the tent, so you can kick dirt over your ‘offering’. It’s functional, basic and your knees have to work. 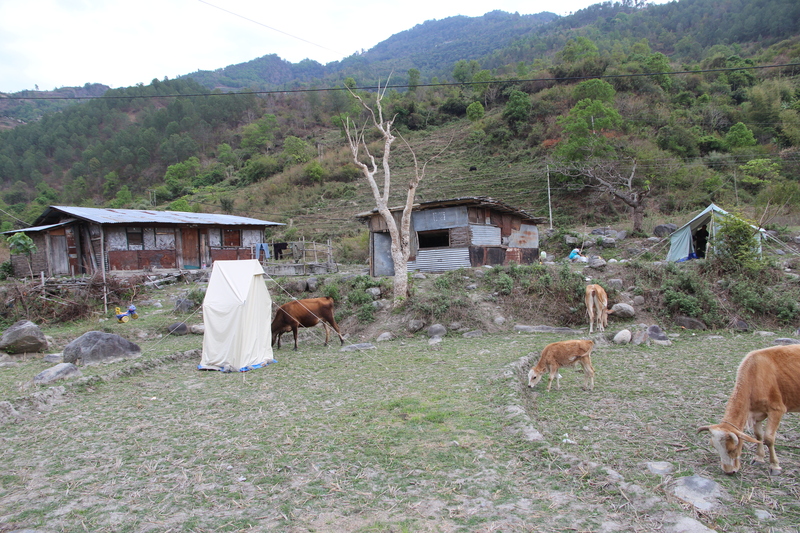 The day of the flea attack, we were supposed to camp at a place called Chendipji, but the flat ground that was supposed to be used for camping had been taken over by a new stupa (those Buddhist monuments scattered all over Bhutan). So the crew in the van carrying the main camping equipment had to drive on for many kilometres to find a place even remotely suitable for camping. Of course, after much searching they found a place that was ‘remotely suitable’ for camping. The dining and kitchen tents were pitched beside the road. Our sleeping tents and the toilet tent were perched on a small cliff, which was home to a few dogs, and overlooked the other tents and a vast valley. Poor John had pointed out some broken bits of glass on our cliff, and I had noticed that the toilet tent was rather close to the edge. So about midnight when the bladder called, I opted for convenience and safety instead of stumbling toward the toilet tent. 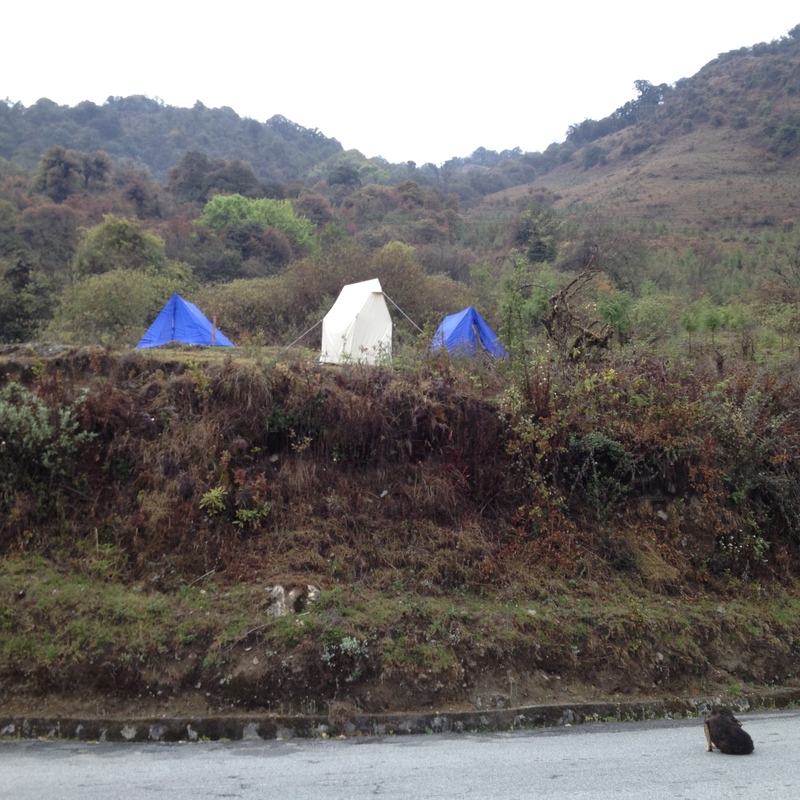 Around the back of my tent, I dropped my daks and had a quick pee, disturbing hundreds of ferocious fleas. They were quick, deadly and hungry. Flea bites take forever to calm down, so six days later I’m still suffering. And I figured if I have to suffer, you can too, even if it is too much information. Eeek – bugs love me too, never had it this bad though!! Hope you are suffering less very soon!! Writing the blog post seems to have had a good effect. Most of the flaming red flea bites have now subsided to a pale pink. The joys of being an intrepid traveller! Boy, I feel sorry for you, having those anti-rabies shots. You certainly have not lead a quiet life, have you? I had the then new rabies injections, so 15 in the bum rather than 12–14 in the gut. I wrote a bit about the rabies episode here. Oh my goodness this is a wonderful post! 2. I commiserated with “your bites”. 3. I developed gratitude for my indoor plumbing. I’m damn grateful for indoor plumbing too. And Advantix that controls fleas on a dog. Next time I’ll take buckets of the stuff on my travels. Peggy-The fleas and their nasty bites sound unbearable ! Thanks for sharing TMI. Those every day living tidbits of information are what I love to know about other cultures. My Bhutanese students told me about too many bugs!!! I like the everyday stories too. Bhutan isn’t overrun with bugs—not many mosquitos but way too many fleas and flies. Oh, and the itchiness has finally settled down, thank goodness. Now I like travelling but I think you have exceeded my minimum comfort level required for a trip. I will stay home in New Zealand and read about your derring do instead. Hope you had some good salve for the flea bites. Feel free to share the suffering! I’m sure we’re not going to be feeling as much pain and irritation as you. Sounds awful! I’ve developed a sensitivity to flea bites and they remain itchy for days. I can’t imagine getting heaps of bites and in a “sensitive” area. Nasty! Mosquitoes and sand flies really bug me too. I’ve had complications from Ross River fever and Barmah Forest Virus so I am pretty careful these days. The prospect of getting malaria frightens me off travelling to some places. Ross River Fever and Barmah Forest Virus are awful. You’ve suffered way, way more than me. Ohhh, we are so sorry for your discomfort – but feel consoled that we groaned and chuckled through your post. Your misfortune provided a great read for us! Travel on dear Peggy, we love reading about your adventures! I was hoping for a groan and a chuckle, so mission accomplished. And the bites are fading, finally. Sorry to hear of the fleas, yikes! Dogs look nice enough but good policy to follow. I’ll talk to dogs hear but nothing more unless I know their masters. I don’t remember the toilet tent before. Seems fleas might end up there too! Keep safe! On the far northern Alaska tundra flies are thick everywhere too! There would have been fleas in the toilet tent except that the soil dug up, from digging the toilet hole, would have buried any fleas jumping around. looks like quite an adventure! It is an adventure, and a lot of fun. I enjoy your posts very much! Thank you for looking at mine! Thanks. I enjoy your art. You are welcome! So glad you like my art! Have a great day! Oh my, I feel your pain. I’m surprised the feral dogs are tolerated? It’s Bhutan. All animals are safe in Bhutan. They’re meat eaters, but all animals are slaughtered in India. Thank you very much for the like a nice Friday ☺ . So sorry to laugh at your expense. Good luck with the flea battle. Be sure to wear thick clothing. Last time it happened the battle had different stages – I know what is expecting me – so I will be using the ultimate weapon, the one that was really effective – do I sound too much confident? (I’m already feeling itchy! 🙂 a lot! Fingers crossed for your ultimate victory! We once had a major flea attack at home. Had been away a couple of weeks and walked in the back door to be assaulted from every direction. A flea bomb did the trick. Actually a couple of flea bombs. Bhutan sounds fun, but I think I’d rather just use the ground, for I do not want to be the one person who misses the hole…while going either one. Would they let you borrow a shovel by any chance…? And yes, a shovel is always there, plus all the dirt they dug out to make the hole. It’s really quite easy if your knees work.